China’s terracotta army is set to invade Britain. A dozen of the famous warriors are on show at the British Museum in London in a highly anticipated exhibition—The First Emperor: China’s Terracotta Army —until 6 April 2008. Advance ticket sales are already breaking box-office records. Around 100,000 tickets have already been sold. The terracotta warriors will be shown alongside more than 100 other objects, forming the most important exhibition relating to China’s first emperor, Qin Shihuang (259-210 BC), ever seen outside his homeland. The warriors are the centrepiece of the exhibition, which is surrounded by a full programme of events including films, talks, lectures, festivals, poetry, calligraphy, family events and workshops. “This exhibition will provide a wonderful opportunity to see these extraordinary objects close up and to learn about an empire which at its height was the rival of Rome and was to prove historically more enduring," said exhibition curator Jane Portal. The soldiers are on display after careful rounds of negotiations as China’s economy emerges and the country engages more with the West. Chinese premier Wen Jiabao and former British prime minister Tony Blair signed a memorandum of understanding pledging cultural collaborations between the British Museum and similar Chinese institutions. The British Museum sent four touring exhibitions to China, including the Rosetta Stone and paintings by European Renaissance masters. In return, the terracotta army and the world of Qin is coming to Britain from Xian, capital of North China’s Shaanxi province. 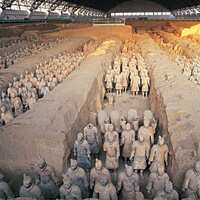 The site there contains some 8,000 life-size terracotta statues of warriors and cavalrymen, fully equipped with arms and horses, and arranged in perfect battle order. Full-price tickets: £12 pounds (about Rs1,000).